A 300-year-old British coin has sold at auction for a world-record price of £845,000. 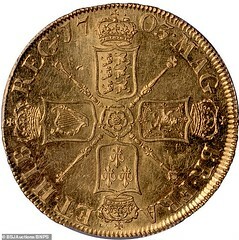 The five guinea 'Vigo' coin dates to 1703 and was made using gold seized by the British from a Spanish treasure ship at the Battle of Vigo Bay. Just 20 of the coins were struck, in celebration of the victory, and they are now among the most collectable pieces of coinage in the world. 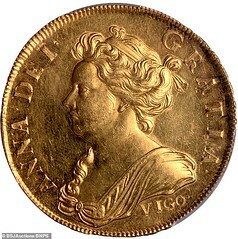 The Queen Anne Vigo coin was sold by London auctioneers Baldwin's of St. James's. The whopping price is the highest ever shelled out for a British coin, smashing the previous record of £630,000 for an 1817 George III silver crown. The series of Vigo coins were made out of 7.5lbs of gold captured from a Spanish galleon. After the British failed to capture Cadiz in October 1702, the fleet intercepted Spanish treasure ships laden with Aztec and Inca gold, coming back from America. The British attacked the Spanish fleet in Vigo Bay and captured the gold and silver on board. The booty was then returned to Britain where, desperate for gold, the Bank of England had it melted down and turned into coins. The pieces feature a bust of Queen Anne on one side and coats of arms on the other. Of the 20 coins struck 16 are known of. This coin spent many years with a private collector who decided it was the right time to sell it.